In less than a month, France’s gilets jaunes (yellow vests) have gone from being a celebrated example of Facebook’s ability to power a spontaneous revolution to a cautionary tale of how social networks can be manipulated by outsiders to provoke outrage and sow dissent. But in both of these extreme scenarios, the central actors lie outside France, whether it’s the platforms based in Silicon Valley or the suspected propagandists in Russia. 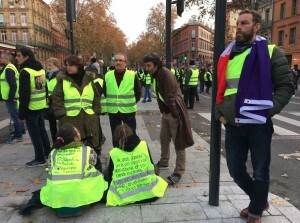 Because the gilets jaunes phenomenon couldn’t be connected to one particular trade union, political party or any other national organization, many looked to the role of the Internet to explain the emergence and diffusion of the protest movement, symbolized by the yellow safety vests that activists wear. The French are accustomed to protests that are scheduled well in advance. There’s even an app called “C’est la grève” that announces strikes, be they with the railways, schools or elsewhere. To read the entire article, click here to the post I wrote for “The Conversation” on December 13, 2018.